From day to day and week to week, one can face many less-than-desirable circumstances in his life. Somehow one manages to slog through these situations, convinced there is not much he can do to improve his lot. Perhaps a project planned for months at work doesn’t come off with the expected success; productivity in the office has declined sharply during the past quarter; or the addition to one’s house takes longer than first envisioned. Such situations are common enough occurrences for many of us. But these need not be the usual state of affairs. People can live a happy existence and accomplish their goals in any area of life—individually, with the family, the job and so on. The aims an individual once visualized for himself can be accomplished. If such goals are not being attained or if one is in a situation that has deteriorated or worsened, there is a valid, locatable cause for this. This concept is one people often do not realize—things are actually caused. They don’t just happen. There are reasons behind every situation—reasons that people themselves can control. Without knowing this, man often relies upon “fate,” superstition, fortunetelling or astrology to determine his destiny or future. Many just hope vainly that nothing else will go wrong or they deceive themselves with the belief that life is ordinarily a struggle. For example, a farmer with a very poor crop one year has no credible explanation for it. He has no concept that he himself caused this condition. However, looking into it, one would find that he had earlier failed to keep seed grain secure for the spring planting, and thus it fell prey to insects. Not knowing this, he might come up with all sorts of odd “reasons” or just blame it on bad luck. In a factory with low production, management could be shifting personnel, hiring new workers, etc., in an attempt to raise productivity before the organization goes under. But executives might not have the skills needed to really examine the company’s own operations to find the cause of the situation. Upon inspection, one could discover that the suppliers of its raw materials refused to deliver because the company’s accounting office wasn’t paying the bills. To look into, handle and improve any such situation in any area of life requires skill in investigation—the ability to think logically and get to the bottom of things. Investigation is the careful discovery and sorting of facts. In investigating, one is searching out and examining the particulars of something in an attempt to learn the facts, especially in an attempt to find a cause. A proper investigation gets to the bottom of the state of affairs facing one. For instance, in any organization, one could observe that its production was down. This is a nonoptimum situation which should be investigated and the cause located. Investigations can also be utilized in an individual’s personal life to improve conditions. In doing an investigation, you are asking the question, “What don’t I understand?” with regard to the existing conditions. You’ll find that two facts don’t agree—they contradict themselves and can’t be understood. So you try to rationalize these two facts: you question these two facts and you will get another point you don’t understand. And when you try to get this point understood, you will now find another fact that you don’t understand. And someplace along the way, you will find the reason for the circumstances you are investigating. Any investigation should proceed along these lines. Sometimes many questions have to be asked, sometimes it only takes a “What’s that noise?” to lead one to the source of a difficulty. Here is an example of an investigation done on a rapid, emergency basis: An engineer is on duty in a ship’s engine room. He has normal but experienced perception: is observing his area. Hears a hiss that shouldn’t be—something contradictory to the expected conditions in an engine room. Scans the area and sees nothing out of order but a small white cloud. Combines sight and hearing. Moves forward to get a better look. Sees valve has broken. Shuts off steam line. In a nutshell, (a) one finds an imperfect functioning of some portion of an organization or whatever he is investigating and then (b) finds something that one doesn’t understand about it and then (c) questions the individuals in that portion connected with the imperfect functioning or looks into the area to get more data. Following this sequence isolates the cause of the trouble which can then be handled so the area properly operates again. In an organization, one can apply just these three steps over and over again, and it will usually be quite enough to keep it running quite smoothly. Statistics play a role in investigations. A statistic shows the production of an activity, area or organization, as compared to an earlier moment in time. It reflects whether or not the area is achieving its purpose—if statistics are up, it is more closely accomplishing what is intended for the area. In doing an investigation, one looks for down statistics. These aren’t understandable, of course, so one questions the people concerned. In their answers there will be something that doesn’t make sense at all to the person doing the investigation—for example, “We can’t pay the bills because Josie has been doing a course.” The investigator is only looking for something he himself can’t reconcile. So he questions the person who gave this data and Josie. Sooner or later the real reason shows up. As one is going down the trail of things he can’t understand, one of two things will happen. Either it is a dead end and it doesn’t go any further, at which time he returns to the main line of the investigation, or it produces further material. And if it produces further material, one will find more things he can’t understand. The trick of this procedure is to find a piece of string sticking out—something one can’t understand and, by questioning, pull on it. A small cat shows up. 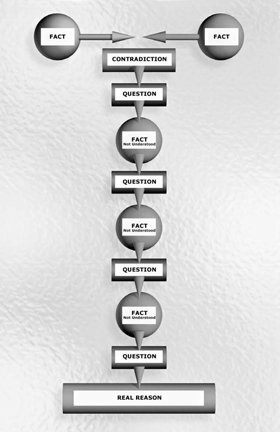 Pull on the string by asking more questions. A baby gorilla shows up. Pull some more. A tiger appears. Pull again and wow! You’ve got a General Sherman tank! In encountering two facts that contradict, one questions on these two facts and gets another point he doesn’t understand. He continues on this path of things he doesn’t get until the real reason is located. It isn’t reasonable for people to be lazy or stupid. At the bottom you find the real cause of no action in a portion of an organization or continuous upset. When you have your “General Sherman tank,” you can take action. There’s always a reason behind a bad statistic. Question those involved until you have the real reason in view. It will never be “Agnes isn’t bright.” It is more likely, Agnes was hired as a typist but never knew how to type. Or the executive over the area simply never comes to work. The real explanation of a down statistic is always a very easily understood thing. If you question enough, you’ll get the real explanation and then you can act. This technique of investigation, while elementary, is highly effective. It can be applied when faced with simple or complex situations to get to the bottom of them, and therefore enables one to resolve them and improve conditions in life. Investigatory skills improve with practice. They can be sharpened and made more effective so that one is able to instantly spot something he doesn’t understand. This ability is not innate in people but can be easily acquired. To make investigations even more rapid and effective, one should be able to understand and apply the principles of logic—a subject that until now has not only been misunderstood but has been made unnecessarily complex. one’s fortune in life; fate. capable of being believed or accepted (as true). became harmed or affected by; became vulnerable to or overcome by. Prey literally means an animal that is eaten by another animal as food. interpret or explain from a rational (reasonable) standpoint. any device in a pipe or tube that regulates the flow of a liquid or gas, as for example the valve regulating the flow of steam in an engine room. Such steam is produced under extremely high pressures and is very hot. If a valve breaks in such a steam line, the line must be shut off immediately to ensure that the hot, pressurized steam does not escape through the broken valve, which could severely burn anyone nearby. in a few words; concisely. to make two or more apparently conflicting things consistent or compatible; bring into agreement or harmony. a tank of the United States armed forces, as well as French and English forces, in World War II (1939–1945). It was named after William Tecumseh Sherman (1820–1891), a famous general in the American Civil War (1861–1865). General Sherman tank is also used figuratively in reference to the real reason behind a situation, or somebody who is trying to stop things. relating to qualities that a person is born with.